Whether you’re trying to sell your home in Jacksonville or just trying to turn your neighbors green with envy, it’s important for the overall presentation of your home to have a healthy, well-maintained lawn. “Curb appeal”, or how attractive your house looks to someone who pulls up at the curb outside, is the first thing people will notice about your home and the first thing potential buyers will consider. You only get one chance to make a good first impression, and properly maintaining your lawn is key to making your one chance count. In Florida, with the high average temperatures and heavy rainfall, keeping a healthy, eye-catching lawn presents a unique set of challenges. Some people resort to hiring landscapers to do the heavy lifting for them. In truth, though, there are dozens of little things that you can easily do yourself to make sure the grass really is greener on your side of the fence. Maybe the hardest part of dealing with lawn and garden pests is figuring out just exactly which little critter is damaging your lawn. Luckily, there’s an incredibly cheap and easy solution to your problem. First, just mix about two tablespoons of lemony dish detergent into two gallons of water. Then, pour it over a small area in your yard where you’ve noticed damage. If there are any hard-to-spot pests in the area, this will flush them out to the surface and make it easier to identify the culprits. At that point, the solution is a quick Google search away. If that doesn’t work, try the “flotation method”. Just cut the bottom off of a can of paint or any can of similar size and then drive the cylinder you’re left with a few inches into any problem areas of your lawn. Then, just fill the cylinder with water and see what floats to the top. If you’ve got lawn pests, it’s a great way to figure out which ones without a costly call to the exterminator. There are literally hundreds of types of grass, with different textures, looks, and ideal conditions. What works in one place may not work in another. Homeowners from other areas sometimes aren’t familiar with the rough conditions grass has to deal with in Jacksonville. A more durable, hearty strain of grass, like St. Augustine, is best equipped to deal with Jacksonville’s unique weather conditions. 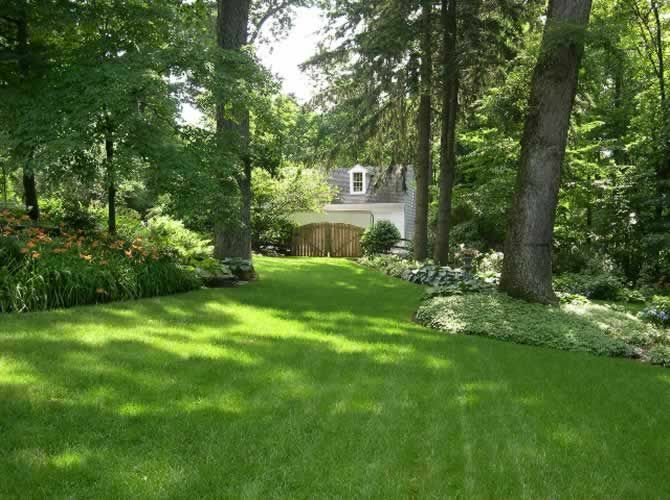 Nothing helps highlight and enhance a lawn like a few well-placed trees. They offer shade, they break up the monotony of a yard, and they add hints of color to the sea of green you’ve hopefully built for yourself. The only problem is that they can be a huge hassle to mow around. An easy fix is to just surround your trees with a small circle of mulch. It not only adds another interesting visual element, it lets you easy mow around trees without fear of damaging them. For flowerbeds, a good idea is to use plain bricks sunk into the lawn around every flower bed to create a barrier with the grass. That way, you can mow right over the brick area, keep your grass neat and orderly, and never worry about damaging the flowers you worked so hard to plant and maintain. Obviously, these are just a few tips, and there are hundreds of others. Shoot us an e-mail and let us know how you keep your yard neat and beautiful. If you’re looking for for a yard (and a house) of your very own, give Team Kelly and Wanda a call. We’re Northeast Florida’s trust source of beautiful luxury homes for sale in Jacksonville.